Free to members or with admission. All ages welcome; children younger than 12 should attend with an adult. Lynden is offering a series of holiday giftmaking workshops between November 13 and December 11. They range from simple activities suitable for families with smaller children to more advanced workshops for adults. To enhance the celebratory spirit, we will have light refreshments available for participants. Whether you are making a gift for yourself or another, these workshops should provide a cheerful atmosphere for art making as we head into winter. To see a complete list of holiday giftmaking workshops, visit our Workshops page. Naturalist Naomi Cobb will introduce you to the wonderful array of birds that spend the winter in Wisconsin (and that we are observing as part of Cornell's FeederWatch program). 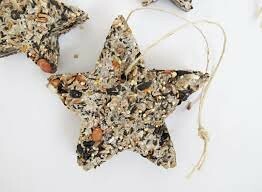 Taking their preferred winter diet into account, you will assemble a variety of birdseed feeders that your neighborhood birds will appreciate -- they also make great holiday gifts! Seeds and nuts will be used in this workshop.